We are delighted to launch The Breuer Chandelier in the warm up to the centennial year of the hugely influential Bauhaus design school. Taking the much loved tubular Wassily chair by Marcel Breuer as his guiding inspiration, Martin has created an original contemporary chandelier which plays with classical proportions and modernist technique to create a sophisticated masculine aesthetic. 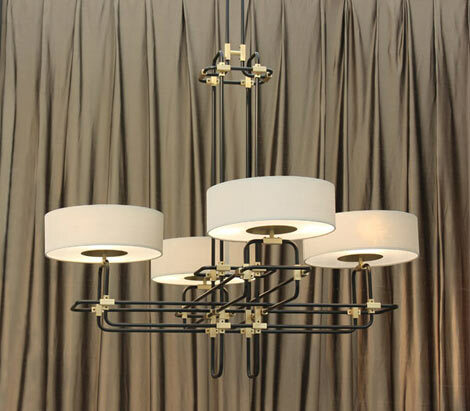 Martin Huxford's innovative Bauhaus inspired chandelier, is designed in three sizes for dining room, salon, hallway and centrepiece situations. Handmade to order, in custom finishes at our Sussex workshop. The Breuer chandelier playfully subverts its classical proportions with an iconic modernist tubular framework. This linear architectural structure mimics the elegant shape and harmony of a traditional chandelier, whilst referencing the apocryphal curved handlebars which inspired Marcel Breuer's famous Wassily chair. The chandelier's distinctive style carries the simple elegance of a line drawing, painstakingly created from hundreds of sections of engineered linear and curved lengths of narrow tube. 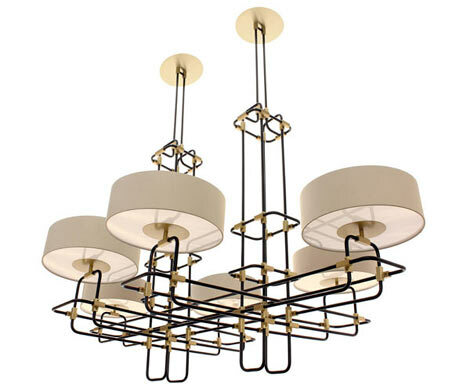 Martin has contrasted the architectural linear structure of the light, with the rich texture of the formal shades and multiple chunky solid brass links, adding a luxurious jewel-like decorative depth to the chandelier. Balancing classicism and modernity, the Breuer chandelier brings a sophisticated, refined aesthetic to interiors. Handmade in three sizes, the fitting can be customised in any RAL colour, and the hand finished brass can be satin or antique patinated, bronzed or nickel plated.